KARACHI: When Safiya was married off to a man, some 20 years older than her, she was barely 13. Her body frame was slim. She was still gaining height and had no idea about the physical demands of a marriage or motherhood. Within just three months, this resident of an underprivileged part of Karachi was expecting. “My brother was married to my husband’s sister. It was a watta satta (exchange marriage). They waited only until the day I started menstruating after which I was married off,” said Safiya. The birth of her first child, born premature, was an ordeal for Safiya. She received several pints of blood for transfusion as she was anaemic and she barely survived. Today, Safiya is a 16-year-old mother of two. She laughs when anyone asks whether she even prepared for the marriage and for the responsibilities of parenting. In Pakistan, according to lawyer and gender activist Maliha Zia Lari, the legal marriageable age for girls and boys in Sindh is 18, while it is 18 for boys and 16 for girls in the rest of the country. “A marriage with a female child under the age of 16 is punishable under Section-498B of the Pakistan Penal Code 1860. In Sindh, punishments extend to girls aged 17 under Sindh Child Marriage Restraint Act,” she continued while shedding light on the legal aspects around child marriage in Pakistan. Pakistan has recently outlawed child marriage and toughened penalties for those guilty of the crime in an effort to crack down on the practice estimated to affect one in five girls in the country. A minimum five years in prison that may go up to 10 years is the punishment, in addition to a fine of up to Rs1 million. A legislation passed by the National Assembly (NA) in February 2017, also bans forced marriage involving women from minority groups. For a second time, the NA’s Standing Committee on Religious Affairs in the following month unanimously rejected a draft ‘Child Marriage Restraint Act’ aimed at increasing the minimum legal age for marriage of a girl to 18 years from 16. Despite the laws and surging criticism, child marriage victims like Safiya continue to endure a cycle of lifelong disadvantages and miseries. Pakistan is also a member of the South Asia Initiative to End Violence Against Children (SAIEVAC), an inter-governmental body which has adopted a regional action plan to target child marriage. Yet, at the grass-root level, social attitudes remain static. According to a Unicef report, State of the World’s Children 2016, at least 21 per cent Pakistani girls are married off before they turn 18. Now, this number on the ground is, of course, higher since a significant part of the populace in Pakistan remains unregistered. Therefore, they also do not show up in surveys. Almost 60 million children in Pakistan are not registered at birth – approximately 65 per cent of children in the country – according to Unicef. Regrettably, the ramifications of underage marriages are also both physical and psychological. Dr Azra Ahsan, a gynaecologist and consultant at the National Committee for Maternal and Neonatal Health, disagrees with the argument that a girl attains physical maturity at 18. “All the organs of a woman including the genital tract continue to grow and mature until she is 18. The emotional maturity, however, comes much later. To me, a girl at 18 is still a child,” she stressed and added that marrying a girl at a tender age and then lumbering her with pregnancies and children is taxing her capabilities to the limits. “Sexual relationship, pregnancy and childbirth are catastrophic for young girls. For them, a sexual relationship becomes a nightmare. Going through a pregnancy is a test of endurance even for grown-up women and one can only imagine what a burden it should be for a child girl,” said Dr Ahsan. She maintained that when a fully grown baby tries to negotiate its way out through a small immature pelvis of a young mother, it becomes a harrowing experience for that child. For Samar Minallah Khan, an inspirational documentary filmmaker, a girl is forced to grow overnight into a child marriage. “Child brides are at a risk of physical and emotional violence, and pregnancy-related complications. Depriving a child of education means perpetuating a cycle of poverty, violence and inequality. The very concept of a girl child as ‘someone else’s property’ prevents parents from investing in her future,” she said. Minallah’s documentaries mainly focus on culturally sanctioned forms of child marriages including ‘pait likhi’, ‘swara’, ‘vani’, ‘sang chatti’, ‘irjaai’, ‘addo baddo’ and ‘watta satta’. “Not many urban Pakistanis know about the forms of child marriages and which is why more in-depth understanding and research needs to be carried out,” she explained. Minallah underlined that during January 2016 to May 2017; only over 35 cases of swara, vani and sang chatti were reported in the media. “Any action taken must be consistent, state-owned and sustainable,” she added while suggesting campaigns at schools and strategic intervention points for adults. While there is an increased awareness about the concept of child marriage, few voices have also started making a lot of noise against it in Pakistan. Designer Waqar J Khan and his team started one such campaign that made waves earlier this year with the hashtags #fashionforacause and #againstchildmarriages. The fashion shoot showed three girls dressed as child brides, juxtaposed alongside their photos in sportswear ready to take on the world. 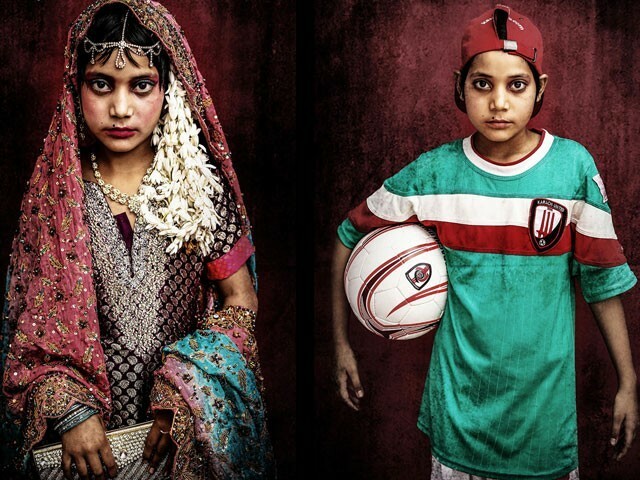 “The purpose of the shoot is to build awareness about child marriage, and promote women in public spaces, especially the sports field,” said Khan. Younger girls mean long birthing life, which is considered important in our culture. Lari feels that it is still a taboo to talk about women’s sexual and reproductive issues and the hush around the subject means that people do not actually see the human impact. According to the gender activist, women in Pakistan witness several examples around them – their grandmothers and aunts – who were child brides and mothers and so they also think, if they were fine, what is the problem? “There is a reluctance to see a girl as a child. She is seen as a woman as soon as she reaches puberty and thus must be married off before her sexuality becomes out of control”, complained Lari. While there in a rising need to bring a change in the overall Pakistani mindset, Minallah thinks that stringent legislation, complemented by strong implementation was also required. Most importantly, supporting girls’ education is one of the single best investments a country can make to help poverty and prevent early marriages, she added. “A girl who has completed her education is less likely to experience violence after marriage and have children when she herself is a child. Above all, she is more likely to be conscious and healthy,” Minallah concluded. Preventing child marriage has a significant bearing on women’s education in the country. Therefore, it is important that the state must challenge unfair social norms strengthening child marriage by using legal and advocacy campaigning tools. With additional input by Ali Rahman. Posted in Human Rights and tagged child marriage, Dr Azra Ahsan, Farahnaz Zahidi, Pakistan, UNICEF Pakistan. Bookmark the permalink.